We don’t know about you, but we’ve got Post-It sticky notes all over the place. On counters. In books. On our heads … well .. maybe not. 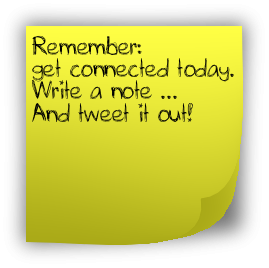 For today’s Daily Connect, add text and/or artwork to a blank Post-it image and post the image of your to a Twitter reply, a Facebook comment, a comment to WordPress post (or link to one for other platforms). For connections. Get sticky with it. Need an online Post-it Note Generator? Here’s one. As an added touch, post a copy on a designated Padlet.